Dakota Style have kept their logo at the top of this packet and included a sort of reddish, purple striped bag with a dreadful drawing of a pizza in the centre. My Mom always said, 'If you have nothing nice to say, say nothing', so apologies for the dreadful. There were some noticeable bubbles in the Chips that enabled them to crunch pretty perfectly. While they are hard and firm, it was not from the cotton-seed oil within which they were cooked, but rather the thickness of the sliced potatoes. A really good snap that was great to chomp on. Crispy, firm and brightly colored, These 'Industrial Strength' Chips were clearly just that. They were firmer and crispier than most Chips we have found in a bag. They look as you would expect if they had been freshly cooked in a fancy restaurant and piled next to your sandwich. You can find pizzas with all sorts of toppings and flavors. 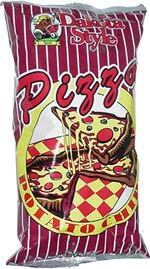 These Chips taste like pizza with all sorts of toppings and flavors. They may be a bit cheesy, and there is definitely some tomato going on. There might even be a pinch of herbs, but overall its a mildly sweet flavor that will work great for some.